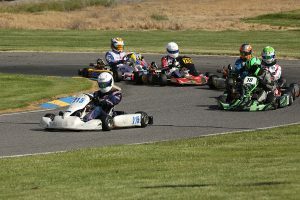 The opening rounds of the Can-Am Karting Challenge got underway on Saturday at the Tri City Kart Club’s Horn Rapids Kart Track in Richland, WA. The weather was ideal for a great day of racing, with temps in the mid-70s, covered by blue skies and scattered clouds. The tumultuous nature of the Rotax program and the decision of the series promoter to begin the transition to the IAME categories likely affected the overall turnout, but even with the uncertainty, just under 70 entries enjoyed close racing and incredible hospitality, including a BBQ that was sponsored by the Wicked Fabrication and prepared by Tri City Kart Club president Craig Chiesa. The vibe in the paddock was very positive. With Rotax Grand Finals tickets still up for grabs for Senior Max and Junior Max, it was not surprising that the racing was very good in those classes. 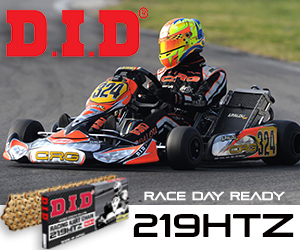 Kyle Dupell (FA) was the driver to beat all day in the Senior Max category, qualifying on pole and sweeping both the Prefinal and the Final. Matthew Taskinen (Tony Kart) and Mason Buck (Tony Kart) were Dupell’s primary challengers and they faced off in the Final to see who would challenge the leader for the win. Taskinen sat second in the lead trio for a majority of the 20-lap race, but as Buck’s kart came in late, he slipped past in turn one at the start of lap 19, laying down his fastest lap in the process. Buck, however, did not have the time he needed to mount a challenge on Dupell, who took the win by 0.314 seconds. Buck and Taskinen joined Dupell on the podium in second and third. Hannah Greenemeier (Kosmic) topped Junior Max qualifying and handled the Prefinal as well, pulling out 2.5-second lead at the halfway point. Jason Leung (Gillard) and Cooper Becklin (Birel ART) battled for second in the Prefinal, setting themselves up for a run at the podium in the final. The best Prefinal scrap was waged between Seth Appel (Birel ART), Marco Kacic (Tony Kart) and Kyle Francis (Tony Kart), as Appel was able to get back Kacic on the final lap to take third. The final was handled by Greenemeier, for the most part, as Leung mounted a charge with four laps to go and pressured the leader over the final lap. Graham Trammell (Tony Kart) and Antonio Constantino (Atomica) qualified within two tenths of each other in the Micro Swift category, which was making its debut in the CanAm Karting Challenge this year. Trammell emerged to take both the Prefinal and Final wins over Constantino, while Lucy Becklin (Birel ART) completed the podium in third, picking up speed with each on-track session. Josh Pierson (Kosmic) was the only driver entered in the Mini Swift class, and he used the track time for focused testing. The 17-kart LO206 Senior class put on a great show of typically close four-cycle racing, but Jacob Gulick (Kosmic) was the man to pull away in the late going to earn the win. In fact, Gulick dominated the day after qualifying on the pole over Derek Wang (FA), winning the Prefinal as well to lock in his front row start spot for their 16-lap final. Invader chassis manufacturer Cole Nelson brought a team up to the event and they performced very well, and their leader showed the way, qualifying third before finishing second to Gulick in the Prefinal. In the main, Gulick went to the early lead as Nelson slotted into second. The man on the move was Kevin Janders, but his overtaking attempt for second on the exit of turn four sent Nelson to the grass, so the Italkart driver was docked with a five-second penalty, which dropped him to sixth after he finished fourth. With Nelson falling back to seventh to fight his way to sixth (which eventually became fifth with the post-race Janders penalty), this opened the door for Wang and Brady Egger (Tony Kart) to battle on-track with Janders for second. In the end, Wang was able to get past for the runner-up spot while Egger passed late in the race as well to finish third. 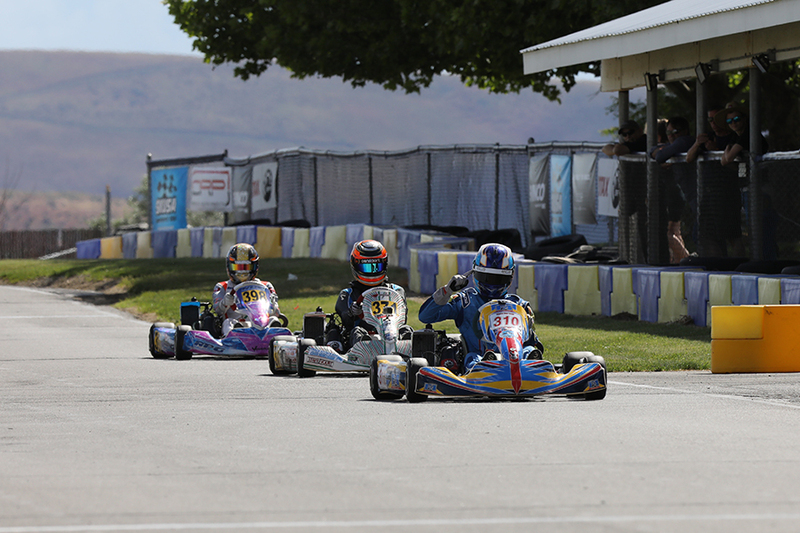 The LO206 Junior class was led by Josh Pierson (Tony Kart), who scored bookend successes in qualifying and the Final, surrounding a Prefinal DNF. Pierson worked his way from the back to take the lead in the late going, coming through a very entertaining six-kart battle for the win. Matt Winfrey (Invader) was quick all day and was charging to the podium when he made contact with Elizabeth Hunter (Tony Kart) coming out of turn four, which sent her around and left Carsen Kunz (Kosmic) with no where to go but the grass. Winfrey went through to finish second on-track, but he received a time penalty for causing the incident, which moved him off the podium. This advanced Cooper Becklin (Birel ART) to second ahead of Daytona Arnzen (Exprit) in third. Chris Mann (Birel ART) qualified on the pole in the Masters Max category, and proceeded to pace Michael Groff (Kosmic) through the 14-lap Prefinal. Chris Eagles (Atomica) ran third, about two seconds back. Over the final two laps of the race, Groff closed quickly to make it interesting, turning the fast lap of the race on the final circuit to show his true form. In the 20-lap final, Groff took the early lead before Mann chased him back down, and they had a spirited battle until Mann took the spot back and drove to the win. Eagles had to fight with Chad Wallace (Birel ART) for third early on, but Eagles’ kart came on late in the race, which allowed him to grab the position and secure the final step on the podium. 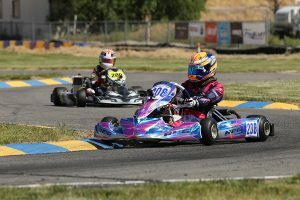 Fresh off his big S2 win at the SKUSA SpringNationals in Sonoma at the start of the month, Kyle Wick (CRG) dominated the action in Richland, qualifying on pole, winning the Prefinal and walking away to the main event victory. The battle between Matt Morgan (CRG) and Conner Wick (FA) lasted all day, and in the end, Morgan finished ahead to take second with Wick completing the podium in third. After qualifying on the pole for the 206 Cadet class, Trey Arnzen pulled out a quick six-second advantage over the field before a mechanical issue put him on the sidelines on lap four. In Arnzen’s absence, Parker Sellner took the win with Graham Trammell (Tony Kart) and Mason Smark (FA) right on this bumper. In the final, Arnzen blazed from the tail of the field to walk away to the win. The drivers will all be back at the track on Sunday for the second round of the series.